My Journey to Fit: Wednesday Workout Update! Running: On Saturday I ran 5 miles with Jeff and Diane. The plan for this run was to get time on our feet with the idea that when I run my next 5K, only running 3.1 miles will feel easy. Well, easier. 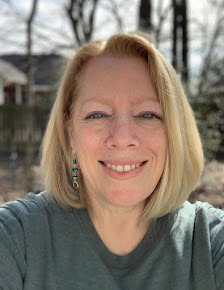 It was one of the warmest days we've had for running this year - 67 degrees with 100% humidity, so between that and knowing that we wanted to run each mile without stopping, we tried to run slow and steady. We ran a 2.5 mile out-and-back that is nice because there's very few turns. There are some hillier areas, but we ran all of them which is pretty good considering I prefer to walk them...and usually do. Not this time, though! I'm happy to say that the run went well and we did what we set out to do. Switching from doing intervals for a long run to only taking a very short walk break after each mile made taking a drink from my handheld a little challenging - I can't drink while running, so I drank less; it wasn't horribly hot but we will be there soon with the weather so I'll have to figure out how to get a little more water in without having a sputtering, choking fit. My sore leg didn't bother me much during the run so I was happy about that - it's weird how sometimes it is so painful (like the evening before when Diane and I were walking around a store after having dinner together) and then other times it's mostly OK. 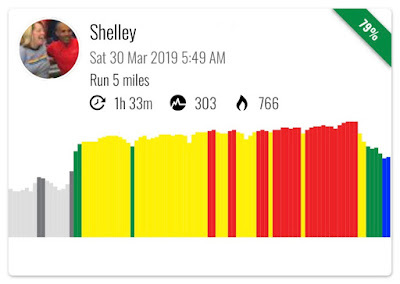 I wore the heart rate monitor that I've been using for a few months at the gym for this run, and I was pleased to see that for the majority of the run my heart rate was in the yellow zone, which means I was working at a good rate. Toward the last part of the run I was in the red zone, which is the top zone, and that was because I was running uphill and then speeding downhill and trying to run a little faster for the last half mile. 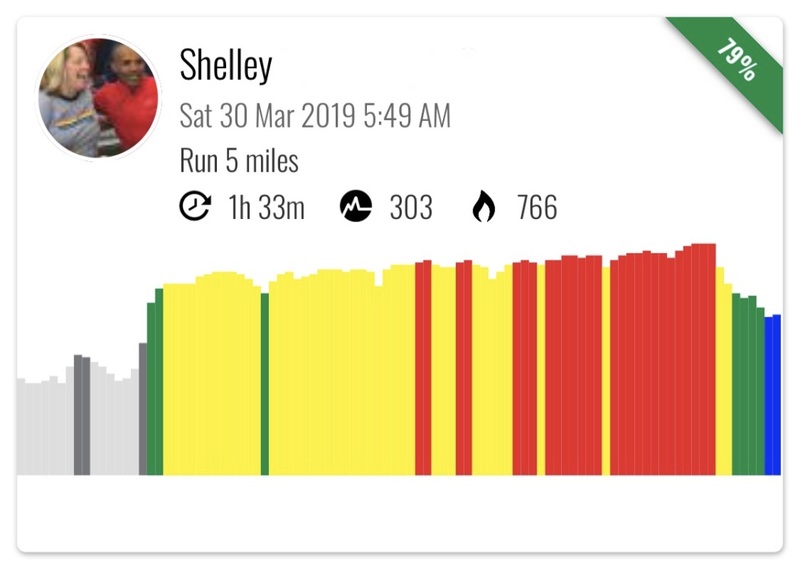 This shows the entire time I wore the monitor, from when I put it on at home until when I remembered to take it off after the run. Also it says I burned 766 calories which...nah. I figure I burn about 100 calories per mile. My biggest challenge with the run was the new pair of capris that I wore - I bought a pair with side pockets so I could carry my phone (which I need for my music and the heart rate monitor), but they ended up being too big and I kept needing to pull them up - it was like I was running in MC Hammer pants! This was annoying because I just bought them and tried on two sizes but apparently misjudged what size I should have bought. After we were finished with breakfast I went out on another hunt for capris with pockets that didn't cost a ton and let me tell you that will break your spirit pretty fast, trying on pair after pair. This was about as bad as trying on swimsuits! I finally found a pair at Marshall's so I was happy about that, but dang, I don't want to do that again anytime soon. BCS Fitness: On Monday we did a workout where we did 5 reps at a time with a little break in between, for a total of 25 reps, and because the reps were so small, we used heavier weights. For the dumbbell bench press I started with 17.5 pounds but immediately knew I could do more so I ended up with 25 pound dumbbells! I was pleased with that. We did a row using one dumbbell and I was able to use a 30 pound dumbbell on that one - it was nice to know that for a short time I could use heavier weights. Of course I really shouldn't be surprised with the row as I train for that movement every week with my "carry all the groceries into the house in one trip" move, haha. Yesterday's workout was similar to Monday's only different muscle groups were targeted. Along with weights, we did a dead-stop push up, where you go all the way down to the floor and then lift your hands up for a moment before pushing back up. THAT was challenging! I did 5 sets of 5, with one of them from the toes but the rest from the knees. It was a struggle to get back up but I was happy when Jared said my form was great - little things like that help keep me motivated. As for my dumb hip/leg/knee pain, I went back to my ortho yesterday and along with trying another round of prednisone, I'm going to start physical therapy on Monday. Geez I hope this works because when it hurts, it really hurts. You are on fire with running and exercise!!! I have to admit...I giggled when I read about your Capri adventure while running! Good luck with the leg pain!!!!!! The MC Hammer capri story is funnier now that I've moved past it, LOL. Great job on your 5 miles and all your strength training way to go! I'm sorry to hear that your still in pain. I hope your physical therapy will help. I'm curious about what your ortho said in regards to your being able to continue working out while going through PT? I hope you have a doctor that understands how important our workouts are to us at the emotional level. My ortho said I could workout as long as whatever I did wasn't hurting me. But he also said I'm dealing with inflammation and rest is the cure for that...so I might be hurting myself or delaying recovery by continuing to do my workouts. Still, I like them too much to quit. We'll see that the PT says on Monday. I hate that - when you put your phone in your pocket and your capris/skirt fall down. I LOVE Skirt Sports. Now they all (skirts with shorts, capris, tights) have a drawstring so if I buy the bigger size (because I hate when they are skin tight and show every bulge), they don't fall down. Good luck with your pain. My calf is almost feeling normal. Now I swear by ART - done by a chiro so insurance covers it. I used to put my phone in a magnetic pouch and attach it to the waist of my Skirt Sports skirt but it started falling down recently, so I tried changing to just capris with pockets. I think my skirts are too big; I'll have to try the drawstring trick but I suspect they are goners. Maybe it's just me but I have never, ever, including in races, counted the walks where I needed to drink "not running." As far as I'm concerned, only 5 minute miler elites drink and run at the same time. As it gets hotter you really need to get your hydration so please don't let walking to drink stop you or make you think you're not running your whole run. Now, running through the water stops and pouring water over my head or neck is a different story! Glad to hear you're getting some PT and I hope that straightens you up! I have had capri issues and I don't always think it's about the size--some of my capris fit fine but when I run, they slide down. I haven't quite figured it out, but since I run/walk, I hike them up during my walk breaks. Even my SpiBelt can't hold them up! I don't drink and run either. Never could. It's just another excuse to walk now. Having to constantly pull them up would make me want to toss them in the garbage! I'm going to try wearing the MC Hammer capris at my gym workout and see if I can salvage them for something, at least. Glad things are going well. I know the humidity makes it that much worse but I am surprised that 67 is the warmest it's been there all season so far. Or do you mean the warmest it's been while you've been running. Have you tried the flip belt pants? They have an actual running belly with pockets built into the waiste band. Oh we've been up in the 80s during the day already but it's actually been a cool spring here so our early morning running temps haven't been too bad so far. I haven't heard of flip belt pants - I've seen the flip belt itself but I don't like wearing something that tight around my waist. Crossing fingers that your PT fixes what ails you - chronic pain during exercise is just the pits, because we want to feel good from the workout, but not the feel bad DURING the workout. I know my physical therapist has worked wonders on me for several issues, so let's hope there's some magic waiting for you, too! Good to hear that you've had great success with PT; fingers crossed I get the same results! With all the advancements and technology we have, you would not think it would be so difficult to find reasonably priced women's workout pants with pockets! Where do designers think we stash stuff? I never understood women's clothes not having pockets! Great job on your 5 miler! I hope you figure out something with the water because it's gonna get hot hot hot (UGH). I HATE capris and shorts sliding down :( Did the new ones you find have a drawstring? I feel like that is the only thing that keeps them up! I also wondered if where the pockets was made the weight of your phone make them slide down. I hope the new ones work better! Nice job with the 30#!!!! !